The canonization of Mother Teresa of Calcutta this month by Pope Francis didn’t just give the Catholic Church a new saint, it gave over a dozen churches across the United States a new name. 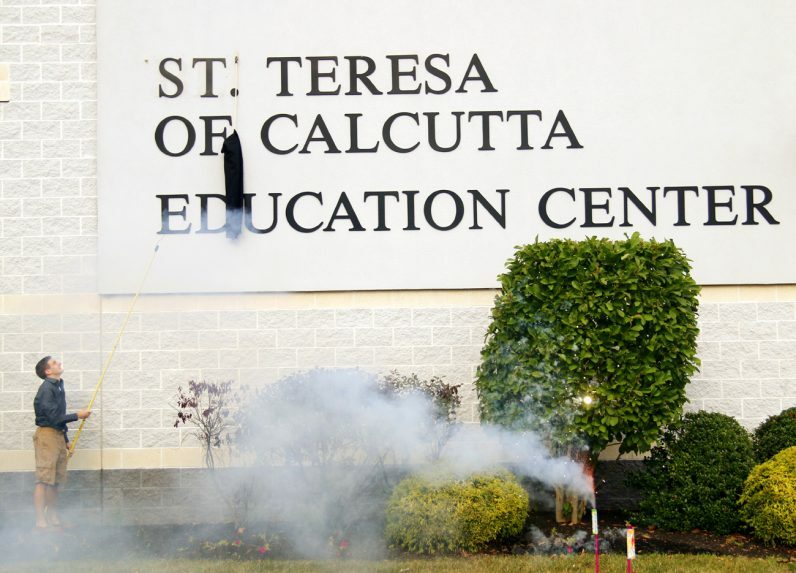 All went from being “Blessed Teresa of Calcutta Church” to “St. Teresa of Calcutta Church,” including one local parish in Limerick, Montgomery County. Founded in 2006 out of the former parishes of St. Clare in nearby Linfield and St. Peter in Pottstown, the name for St. Teresa of Calcutta Parish came out of suggestions by parishioners. According to the pastor, Father Paul Brandt, the officials of the Archdiocese of Philadelphia then considered these suggestions and from the top three — to this day he does not know the other two — the name Blessed Teresa of Calcutta was chosen. The first building on the parish campus to be completed was the religious education center in 2008. Then in October 2012, Archbishop Charles Chaput dedicated the new church. 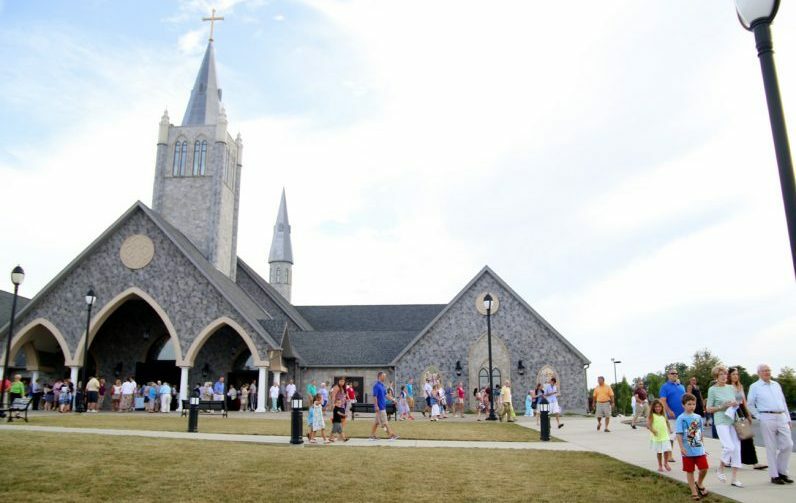 It is likely one of the more beautiful newer edifices in the archdiocese, showing it is still possible to give the faithful a church that will help lift their souls to God. Granted, it is easier to do this when there is a wealth of artistic and architectural materials from closed parishes in the Philadelphia area. The gorgeous wooden confessionals, the marble communion rails, the striking stained glass murals, holy water fonts, painted statues, pulpit, cantor’s stand, high altar and stations of the cross all came from churches or hospital chapels that have closed. This beauty provided a fitting setting for the Sept. 11 Mass renaming the parish St. Teresa of Calcutta, which drew people from across the Delaware Valley to fill the pews to their 1,000-person capacity, including about 10 sisters from the Missionaries of Charity. Auxiliary Bishop John J. McIntyre was the main celebrant for the Mass and his chasuble, a priest’s liturgical vestment, bore the newly minted saint’s image. The homilist was Father Shaun Mahoney, chaplain for Temple University’s Newman Center, who received the honor because while he was “not a confidant,” he had known Mother Teresa, and she had been fundamental in his discovering his vocation to the priesthood. He began his homily by noting the “joyous occasion” of the day. “We’re coming in thanksgiving celebrating the canonization of Mother Teresa. We were expecting it, we were anticipating it, but it’s here now, and we can rejoice, rejoice that we have a great intercessor for us in heaven,” he said. Father Mahoney observed that St. Teresa is “a person bringing light in darkness” and noted that he was struck “by this coincidence that this day of thanksgiving for her canonization” comes on a “very heavy anniversary,” that of Sept. 11. “This is the 15th anniversary of that tragic, horrible act,” he said. “But I couldn’t get over the fittingness of celebrating this thanksgiving today because Mother Teresa — recognizing that she was meant to journey through a darkness to truly be the spouse of Christ, to share in his desolation — said that if she became a saint in heaven, they’d have to look around for her because she’d be spending so much of her time bringing light into darkness here on earth. The music throughout the Mass was beautifully performed under the leadership of John Seitz, the parish’s music director. The Mass also drew a good number of members from the region’s Indian Catholic community, including Ayesha Gonsalves, who originally hails from Mumbai. A parishioner of St. Joseph Parish in Downingtown, Gonsalves attended with her husband and young children. She came in honor of Mother Teresa who “is close to our heart because she was in India and she served Indian people, so this means a lot to us,” Gonsalves said. St. Teresa had a major impact on her life because the saint inspired her to leave her homeland and come to another country as Mother Teresa did. “When I came here from India and became a citizen, when I took my oath, it was really a very precious and touching moment,” Gonsalves said. “I’m a nurse, and when I see someone serving people as she did, it is very tough. 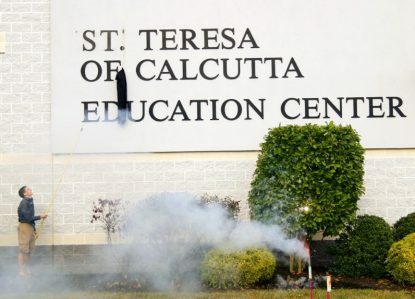 Another person who was touched by the Mass was Missionary of Charity Sister Regis, who joined the order in 1976 and knew St. Teresa well from her two-plus years at the headquarters in Calcutta. Every week he ends his pastor’s letter with a quote by the new saint because her words “are so simple. They’re nothing real deep, nothing real theological. It’s just simple stuff,” he said, and her infectious love for Christ motivates the works of mercy his many parishioners do. Father Brandt revealed one interesting aspect of the church’s sanctuary that is not evident to the passerby. One of the statues adorning the high altar depicts St. Damian of Molokai. Father Brandt chose to represent him because of how the Belgian saint had served lepers in Hawaii, and serving lepers was a big aspect of Mother Teresa’s ministry. When it came time according to church tradition to put a saint’s relic in the altar stone, he was given a relic of St. Marianne Cope, a recently canonized American saint. Only subsequently did he realize she was a close collaborator of St. Damian’s. Her relic rests there in the altar along with a single strand of hair from St. Teresa.